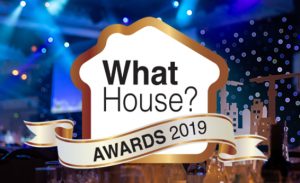 WhatHouse Awards 2019 – Enter Now! Commonly known as the ‘oscars’ of the UK housebuilding industry, the WhatHouse? Awards is the country’s largest event that celebrates the very best new homes. The 2019 awards are now open for entries! Robinson Manufacturing sponsors the Best Medium Housebuilder category, recognising that we like to support excellence wherever it is apparent in our sector. Attracting many of the biggest names in housebuilding, the WhatHouse? Awards Gala Luncheon takes place at the JW Marriott Grosvenor House on Park Lane in London every November, with more than 1,700 people attending, and winners being announced in a wide range of categories. There’s a top-class celebrity hosting the event, with Lord Hague, David Walliams and Rob Brydon headlining in the last few years. The WhatHouse? Awards 2018 – the 37th year of the event – were especially entertaining, presented jointly by comedian Jack Whitehall and Gabby Logan. Entry deadline for this years’ awards is 12th July. Download the 2019 awards entry prospectus. This entry was posted in News from Robinson Manufacturing. Bookmark the permalink.